Pushpa’s story is an extraordinary one. This 40-year-old woman from Chennai, Tamil Nadu, has led a life of transformation. She was a child labourer, she became an empowered domestic worker and is now a leader. Her life is testimony to the powerful role of social movements and the impact that women’s leadership can produce! The youngest of the five siblings, Pushpa was the only daughter to her parents. Having lost her father at a young age, as a young girl Pushpa not only supported her mom in the household chores but was also assisted her at her workplace. A typical day for Pushpa started with accompanying her mother every morning to distribute milk packets to individual households, followed by proceeding to work as a domestic worker in a four-member household. During the one and a half hours she spent there, the young Pushpa had to wash clothes, clean the house and the courtyard, and support in the kitchen. Then she would rush back home to attend to the needs of her brothers at home and later prepare for school. Often reaching school late, Pushpa would regularly be punished by the teachers! When the school day ended and she would go to work again — the evening shift. The demands on her time Impacted her school work, and she couldn’t clear her Board exams! Marriage didn’t bring much cheer to Pushpa’s life. Her husband was physically abusive and dependent on alcohol. Balancing her work-life with child care, she remembers how, given the family’s economic hardships, she even had to cut short her maternity break to provide for her family, and carry her 2 month-old baby along to the workplace! 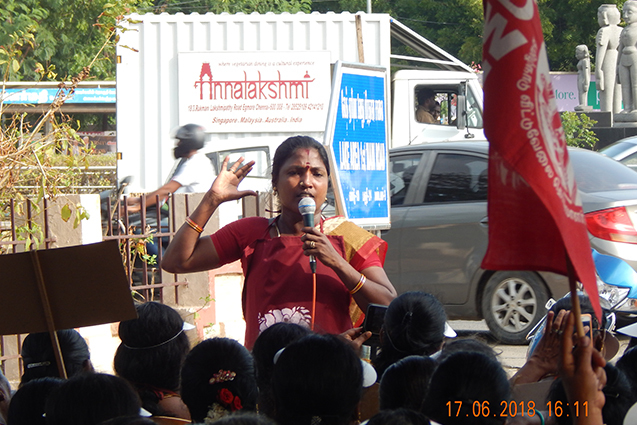 In 2007, Pushpa came in contact with a community activist from the National Domestic Workers’ Movement (NDWM), ActionAid India’s ally, who was mobilizing domestic workers to join the Tamil Nadu Domestic Workers’ Union. On learning that a forum of domestic workers exists to campaign for their rights, Pushpa immediately joined the union. “The fact that domestic workers are discriminated against, and excluded from legal protection and recognition used to disturb me hugely. It is during the first union meeting I attended that I realized that our work too merits dignity and respect. And that is when I felt it was justified on my part to be seeking a pay hike; I thereafter made a request to my employer for the same. However, what it led to was the termination of my services. But I chose not to lose courage and further resolved to assert my rights,” recollects Pushpa. Through regular participation in leadership development and legal awareness programmes organized by NDWM, Pushpa gained rich perspectives on women’s rights, labour rights, and the causes of exclusion and poverty. She also got opportunities to listen to and interact with prominent women leaders and to network with them. This wide-ranging exposure saw Pushpa transforming from a timid and quiet woman to a confident leader and a strong advocate of labour rights. Over time, given the strong articulation and leadership displayed by her on domestic workers’ issues, NDWM encouraged Pushpa to take up the position of Treasurer, Tamil Nadu Domestic Workers’ Union. Today, Pushpa is a part-time field mobilizer at NDWM, attending meetings of unorganized workers’ federations, speaking at public gatherings, addressing the media and accompanying the various unorganized sector groups for presenting memorandums to the concerned government departments. She is also actively facilitating the union members to access social benefits under the various State schemes.